This app is built for new and existing users of Stripe. It allows you to charge a customer's credit card quickly and easily using your mobile phone. Login fast using a PIN. Just enter the transaction amount and card details, hit 'charge card,' and the charge is securely sent to Stripe. Funds arrive to your bank account on a 2 day rolling basis. When you use PayNow no sensitive card data is ever stored. The app uses Stripe’s mobile API to encrypt and pass data to the Stripe server where it is securely processed as a CNP transaction. Stripe is certified to the highest level of PCI-compliance. Simply tap any card with the PayWave/PayPass logo to the back of your NFC capable device until it beeps and it will fill the card details instantly. Alternatively, you can manually enter the card details or use your device camera to auto populate. PayNow for Stripe beats competitors hands down on price! Just 0.5% per transaction using this app, in comparison to $50 - $100 per month to hire a mobile EFTPOS machine... not to mention all those extra fees the banks seem to slip in. PayNow for Stripe is a quick and easy way for our delivery guys to take credit card payments if a customer doesn't have cash. It's a lot cheaper than a mobile eftpos machine from the bank. I sell hand-made jewellery at a local craft market. Up till now it's been cash-only, but thanks to PayNow I can now accept credit cards - excellent! We already used Stripe to take online bookings for our holiday home. This app is great because now we can process credit cards over the phone and in person quickly and easily. Thanks for a wonderful app! Stripe is a credit card processor for web and mobile. They process billions of dollars a year for thousands of companies of all sizes. One of the best things about Stripe is their awesome set of APIs, which allow developers to build tools that do more with Stripe – that’s what we’ve done with this app. You will need a Stripe account to use PayNow for Stripe, and a key thing to keep in mind is that it’s Stripe doing the real work. PayNow is just a nicely designed mobile app interface you can use to talk (send a credit card charge) to Stripe. Learn more at stripe.com. Is PayNow for Stripe secure? Yes, it is secure. Stripe is certified to PCI Service Provider Level 1. This is the most stringent level of certification available. 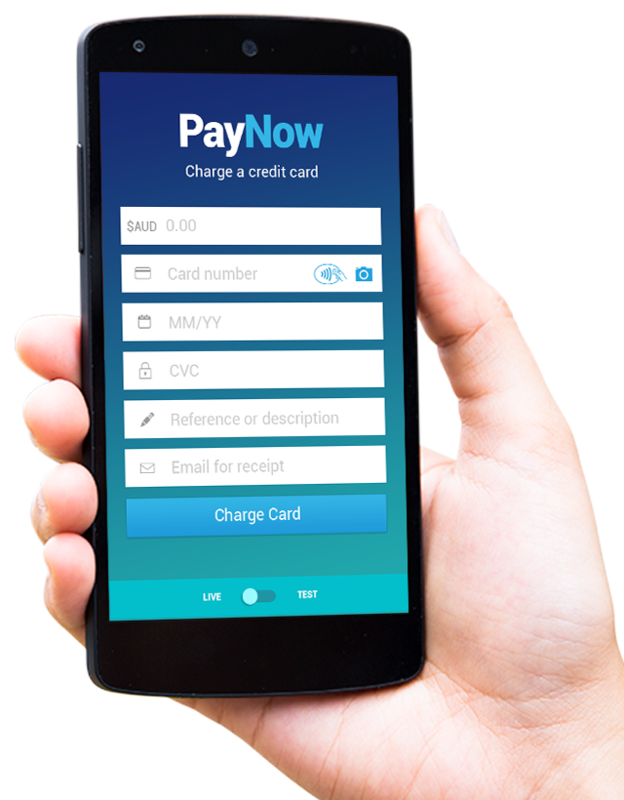 When you use PayNow for Stripe, no card data (or other sensitive data) is ever stored on your device – the app uses Stripe’s mobile library to convert card data to a single-use token which is then safely and securely passed to the Stripe server for processing as a card-not-present (CNP) transaction. To learn more, visit Stripe’s documentation and security practices. With PayNow for Stripe, you can accept payments in any currency supported by Stripe in your location. Briefly, there are 138 supported currencies for US & Europe, and 117 supported currencies for Australian users. Please view the full list here. PayNow for Stripe app adds a fee of 0.5% per transaction. The app is free to download. Stripe has its own costs, which are outlined on their website here. Stripe has no set up fees, no monthly fees, no refund fees, and no hidden costs. All up, this is about as cheap as it gets for processing credit cards. Stripe adds funds to your bank account on a rolling basis. You can set the frequency of these transfers in the Transfers tab of your Stripe dashboard. From there, you can also view all transfers from Stripe to your bank account. How can I test my setup? Easy! Use the switch on the charge card screen to switch between test and live mode. Use the test card details found here. Note that Stripe does not send email receipts in Test Mode. Can I disconnect my Stripe account from PayNow? Yes. Login to your Stripe Dashboard then visit Account Settings > Connect > Connected Applications > and use the cross icon to revoke access to PayNow. Disconnecting your Stripe account from PayNow will mean you can no longer use the app to take payments. It’s sensible to disconnect if you no longer wish to use the app, or if you want to connect a different Stripe account to the app instead.